Here is a rustic Sitting Bear Table Lamp that features a Resin bear figure in a distressed black finish with a rustic crackled shade highlighted with a bear paw design. 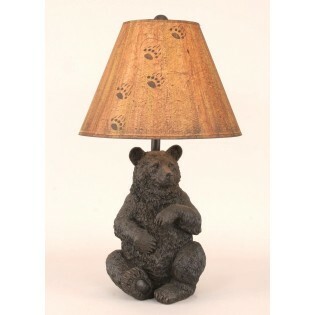 Here is a rustic Sitting Bear Table Lamp that features a Resin bear figure in a distressed black finish with a rustic crackled shade highlighted with a bear paw design. Enjoy this Sitting Bear Table Lamp nest to your favorite chair or at your bedside.